In this post, we'll install Tomcat 7, the new JDK 7, configure Tomcat as a service, create a start/stop script, and (optionally) configure Tomcat to run under a non-root user. I have just updated this post with Tomcat 7.0.29, the current stable release of Tomcat 7. JDK 1.6 is the minimum JDK version for Tomcat 7. We'll install the latest JDK, which is JDK 7, Update 5. The JDK is specific to 32 and 64 bit versions. My CentOS box is 64 bit, so I'll need: jdk-7u5-linux-x64.tar.gz. This will create the directory /usr/java/jdk1.7.0_05. This will be our JAVA_HOME. We will install Tomcat 7 under /usr/share. As you can see, we are simply calling the startup.sh and shutdown.sh scripts located in the Tomcat bin directory (/usr/share/apache-tomcat-7.0.29/bin). We should review the Catalina.out log located at /usr/share/apache-tomcat-7.0.29/logs/catalina.out and check for any errors. Tomcat 7 contains a number of changes that offer finer-grain roles. In the case of our installation, $CATALINA_HOME is located at /usr/share/apache-tomcat-7.0.29. By default the Tomcat 7 tomcat-users.xml file will have the elements between the and tags commented-out. . So, open the Catalina.sh file located under /usr/share/apache-tomcat-7.0.29/bin with a text editor or vi. Great step by step, congratulations... Help me so much. Thanks, Pablo. Glad you found it useful. Thanks, this guide really helped me out. +1 to that, really helpful. I've installed solr with tomcat a dozen times or more on Windows but faced with a bare-bones RedHat server and zero linux experience was a bit befuddled. Happily your instructions contain enough detail to get me through even the n00b linux hurdles of making users and groups, chown etc. So big thanks! Awesome piece. Straight to the point and on-point. Good one David. Thanks a lot David, I followed your guide and everything looks fine.
. Why was that?, or is irrelevant how it is called? Please look again at Step 1. Thanks for pointing this out. I have updated both to CATALINA_HOME for consistency. You could call it ANDRES_HOME and it would work the same. I am learning JEE and Ubuntu. I have installed oracle java successfully (1.7). 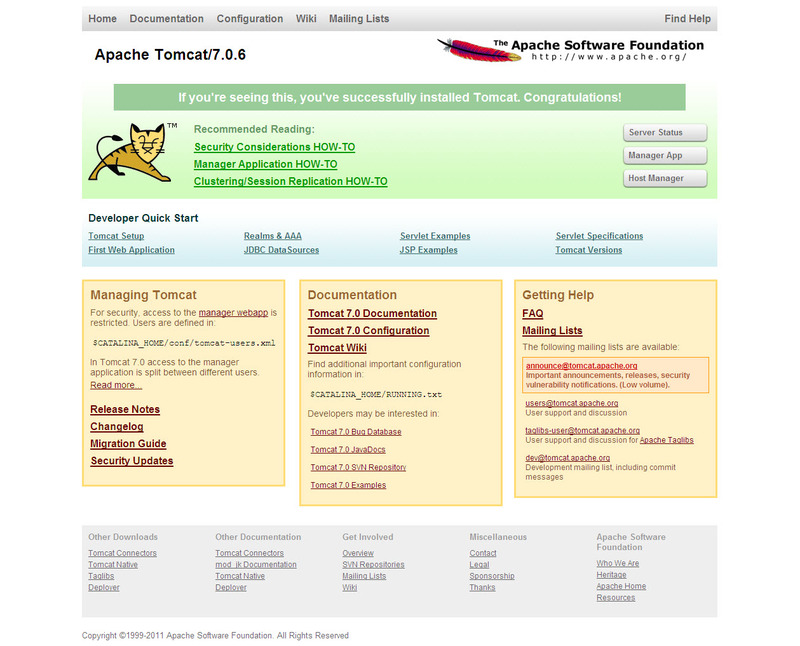 Downloaded apache-tomcat 7.0.23 . Sorry, but I'm not familair with Ubuntu. For anything more with Ubuntu, I'm afraid I'm quite useless. One note: You should not edit catalina.sh to set options! Create a file setenv.sh in the tomcat bin directory were you set all options you need. This file is read by catalina.sh since tomcat5. Its good to note the setenv.sh functionality. Unless I am working with others and want to keep things tidy, I almost never use it. Probably lazy, but I prefer adding a couple of lines to an existing file over creating additional files. How come you didn't use the rpms? The installation is more transparent if you avoid the rpms. Excellent article. No short cuts taken in the explanation....you saved me days of work! Just a quick note, last stop/start service script is missing /bin before .sh files in their path definition. The 'sh' is not required in the second script. in the last stop/start script, e.g. for the line 16, it should be /bin/su tomcat $CATALINA_HOME/bin/shutdown.sh, while it is /bin/su tomcat $CATALINA_HOME/shutdown.sh at the moment. On step "chkconfig --add tomcat" I get "service tomcat does not support chkconfig" anyone know why? Firstly, grep to see if tomcat is running. If so, check that port 8080 (or whichever port you are using) is open. 1. Check that tomcat script is executable. At the start of the script. Can you also write a guide that shows how to set up multiple virtual hosts in Tomcat- for eg. one web app at http://subdomain1.domain-a.com/ and another web app at http://subdomain2.domain-b.com/ ? I could not find a good guide that explains setting up Tomcat 7 with multiple virtual hosts. Or if you could point me to an existing guide that shows how to do this, I would be extremely grateful. Perfect explanation. Thank you so much!! I can only see the lines above as my comment system only allows so many lines. If you can post the full stack on PasteBin or similar, I will be happy to take a look. Thanks for your nice article. I have followed your process but I have been facing a problem. My web server starts with no error and the port 8080 listen but when I give a URL like localhost:8080 but it shows waiting but after few time it shows the connection was reset. What may be the error for this kind of problem? After opening 8080 did you save the iptables? Awesome, It was very helpful for me. Wonderful tutorial! Thank you very much! Great tutorial! I've configured tomcat perfectly! Thanks alot! Very Helpful tutorial :) Thanks. Awesome Article. Explained Step-by-Step wonderfully. Thanks David. Wow, thanks for a great tutorial, you saved me hours of trial and error! Perfect tutorial to setup a perfect configured tomcat! Thanks a lot! Hi @David thanks for reply, I solved this issue. Thanks again for sharing this articles. David, thank you for such perfect explanation! But I still can't add tomcat to autostart via chkconfig. If you are unable to add the script to chkconfig, please check that you made the script executable (chmod 755 tomcat.sh). If executable and you still get an error, try recreating the script using vi as your file may contain problems. I have used your instructions on more than one occasion. Thanks so much for your contribution. Thanks for this great guide, and I finally got it to start on bootup, but I had to add runtime level 5 with chkconfig --level 2345 tomcat on command. Would this be because the server is stopped when I log onto the X display manager? before step 4, when you do http://yourdomain.com:8080. This is an awesome guide. It helped me a lot. Tomcat is successfully running on my fedora 14. But I can't access it from a remote windows 7 pc or any other linux pc. What are step wise configuration procedure to access my tomcat and mysql database from any other remote pc? My tomcat version is 7.0.37. Port is 8080. It sounds like port 8080 is not open on your server. Thanks for that great and very detailed installation how-to! Excellent!! Very helpful. Thank you!! thanks for the guides ,very useful ! How can I do this with only secure shell? How can I download? You can download Tomcat using wget as shown in Step 2 above. Really This is very Helpful tutorial for whose first time configuring Apache Tomcat. Thanks a much !! Really, one of the finest tutorials I've come across. Clear, understandable, with good examples for every step. Is tomcat-7.0.29 the actual version you installed? Excellent instructions. Worked perfectly. You rock! Thank you for such a thorough and helpful tutorial! In step 4, one of the new roles is shown as admin-gu. Shouldn't that be admin-gui? great tutorial! Wish I had found this one first! Thank you. Very clear step-by-step instructions. Thank you very much. This is one of the best step-by-step tutorials on the internet. I managed to setup this on my vps flawlessly. God bless you for sharing. how to separate database server from application server , on different server? thanks for this great tutorial...!!! just let me know what i have to add in start/stop script so that i can able to check the status through cmd service tomcat status Thanks in advance..!!!! Great, however in the docs (RUNNING.TXT in catalina home) says: Note: Do not use JAVA_OPTS to specify memory limits. You do not need much memory for a small process that is used to stop Tomcat. Those settings belong to CATALINA_OPTS. But when I excute "service tomcat start",it display "sh: /bin/startup.sh: No such file or directory". It looks like, the shell can not read the "CATALINA_HOME" variable. Why? Thank you verymuch! If you are running as minimal user tomcat (Step 6 above), you still need to issue stop/start/restart as root. Very good documentation indeed. Compliments. Now, how do I tell Plesk that I have installed Tomcat 7. Current implementation of Plesk is configured with Tomcat 6. I could not find enough resource on Plesk forums on this subject. It works very well. Thanks!!! Thanks for your guide. I am not a Java guy. But your tutorial really helped me a lot to setup a server for a friend. thanks for the information provided. It was very useful. I think CATALINA_OPTS is better than JAVA_OPTS for Heap memory settings (Stop 6). # "run" or "debug" command is executed. # the version command etc. # Examples are heap size, GC logging, JMX ports etc. I'm quite sure you have the best step-by-step tutorial of this kind! Thank you immensely! I have updated step 6. Such a useful and well written tutorial. Thank you so much for this! You're a life saver. This was great. Any chance you might do in for Jboss 6? any idea abt this error? Please check you init script. It doesn't seem to match the actual location where you installed. '/usr/share/apache-tomcat-7.0.70-src/logs/catalina.out': No such file or directory /usr/share/apache-tomcat-7.0.70-src/bin/catalina.sh: line 415: /usr/share/apache-tomcat-7.0.70-src/logs/catalina.out: No such file or directory any idea about this error guys.How to fix it? Got Tomcat up and running if few minutes... Great post! Tanks a lot David! Thanks David for sharing. However, i encourntered issues as below in TOmcat 7.0.78 [xnat@ip-172-31-4-176 bin]$ sudo systemctl start tomcat Job for tomcat.service failed because the control process exited with error code. See "systemctl status tomcat.service" and "journalctl -xe" for details. I have reinstalled tomcat, but had same issues. But when i ran /etc/init.d/tomcat start i can start the services.